This high quality Absco Pool Pump Cover has a hinged roof as well as a hinged front access door and it is designed to cover most household pool pumps and filter systems. For permanent secure installation of your pool pump cover, it is recommended to use anchors. 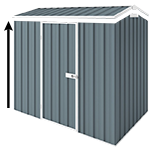 To secure the wall panels to the concrete slab you will need 12 anchors for this shed.